Kids love breakfast in Spain. Especially when they hear that hot chocolate and cake, buns and biscuits are on offer. 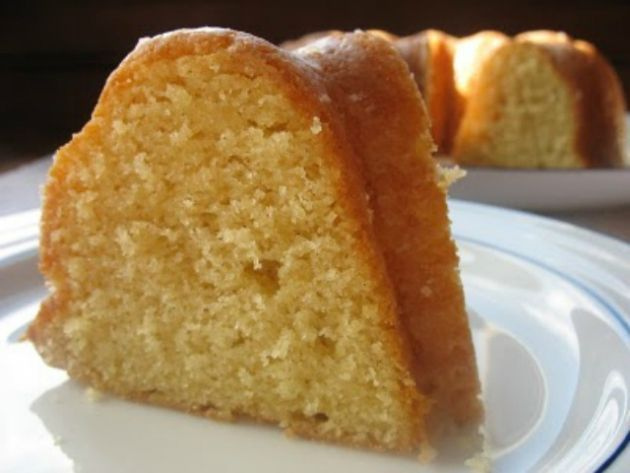 It sounds pretty unhealthy but it is commonplace for kids to have a bun or a slice of sponge cake and a glass of hot milk with Cola-Cao or Nesquik (only the chocolate flavour). If you think of it, it’s not so bad for them – as long as they don’t spend the rest of the day eating sugary things too! Of course, you’ll find the usual big brand cereals at your hotel and in the supermarkets. And breadrolls, croissants and toast. It’s a bit harder to get bacon and sausage if you are not in the bigger cities – and you should convince your kids to try the Spanish tortilla (read our post about tortilla here)– whether it’s at the breakfast buffet or for a mid-morning snack later. When it’s freshly made, it’s heavenly and will give them all the energy they need for a few hours. A slice of bread with fried eggs and potatoes. Once your kids taste Spain’s potato omelette, they’ll be hooked forever! Because lunch is served late here – chances are your kids are starving! It’s unusual to come across kids’ menus or kid portions when eating out so what we usually do is order one adult’s menu-del dia (set-price menu) for our two girls to share or order a dish of meatballs with fries (albondigas) or a salad and a pork steak or something else. If you don’t see anything you think your kids will like on the set-price or a-la-carte menu, try asking your waiter what they recommend for the kids. 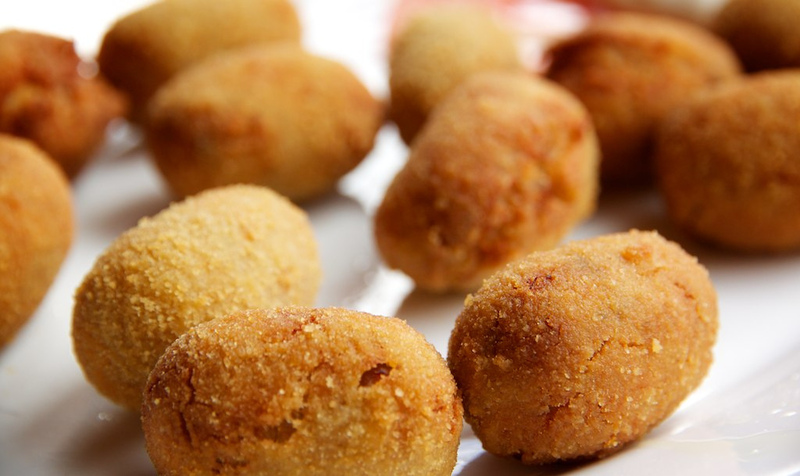 Chances are they will say ‘croquetas’ which are an egg-based croquette usually with ham which are good filler food. You might also be offered a pork steak with fries (lomo con patatas) or egg and fries (huevo frito con patatas). You will never be offered sausages with fries. You may be offered breaded chicken (pollo empanado) often served with fries or fish in batter called pescado rebozado (usually served with salad rather than fries). Bear in mind that Spanish kids (and adults) are quite good at dealing with bones in fish so make sure to ask whether it has been checked for bones (tiene espinas?) or make sure to do so yourself before handing it over to your little one. In time, we’re sure everywhere will start offering kids menus – we’ve already seen the Parador hotel chain has started a great three course set-price menu for kids. 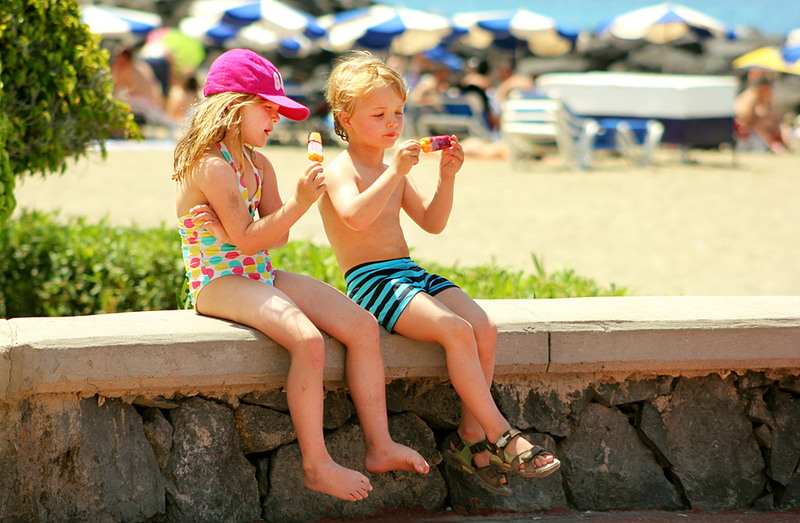 Whilst we admire the Spanish way that kids eat from the same menu and often from the same plate as their parents, we acknowledge that when travelling, it’s a lot easier to have a few ‘kid friendly’ dishes identified. Sometimes, seeing the way the food is prepared can help. Whether that’s being shown what’s in the pot in the kitchen or actually seeing it being prepared outside. Take paella for example – it can be a bit difficult to convince the kids at first (perhaps it’s all the claws and shells?) 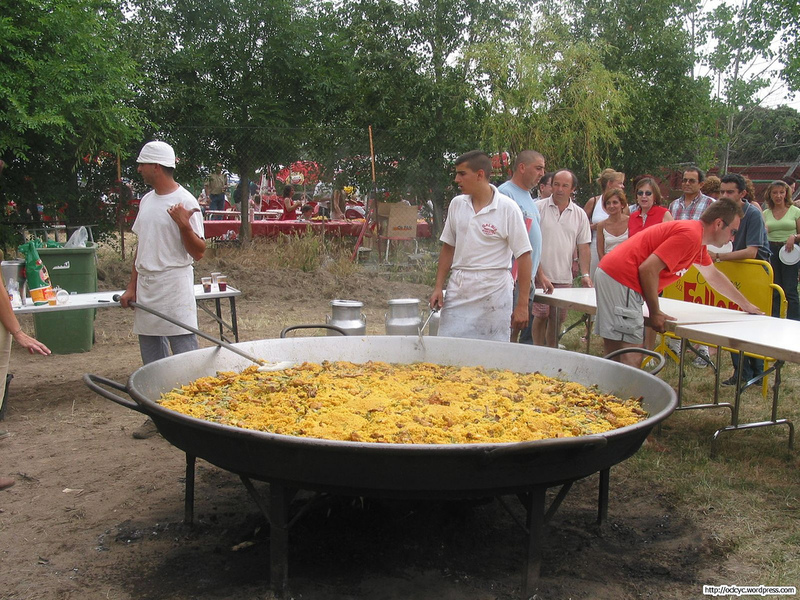 but if you can turn up at a village festival where a giant paella is being prepared, you’ll find it much easier to encourage the kids to try it out. If you aren’t travelling in the summer months when these outdoor festivals are on, consider a cooking class and have the kids make their own paella – read our post on the classic rice dish here with meat, fish or just a veggie option. BTW If you are looking for a simple rice dish for your kid, you can order a plain rice (arroz blanco) which is usually cooked with a little garlic and can be served with a simple tomato sauce on top. This is a handy option if your kid isn’t feeling brilliant – it’s the Spanish equivalent of chicken soup. If your kids have been very experimental or patient and you sense they are in need of a fast-food fix, you’ll find the same international chains here – although perhaps a lot less of them that you might be used to. The reason is that many Spaniards order hamburgers and other snack food at bars rather than fast food joints. If your kids need a pizza and you can’t find an Italian restaurant, you should know the delivery pizza market here is dominated by the fast food chain Telepizza which not only does pizzas but also sells hot dogs, burgers, chicken wings and pasta dishes too. Although they deliver most of their orders, you can also eat-in. In the bigger cities, you should seek out the Peggy Sue’s and VIPS chains which are more diner-like. 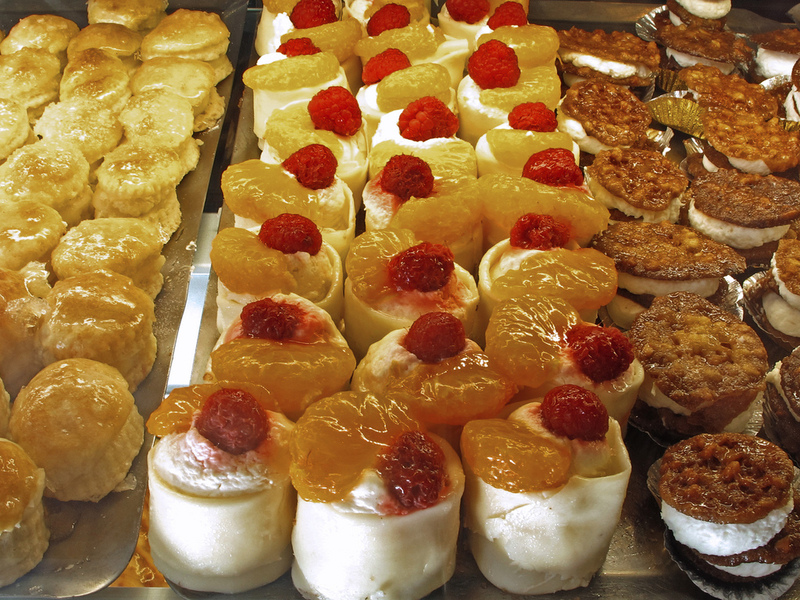 Whenever you sit down to eat in Spain, you’ll find desserts are different. Menus are bursting with traditional offerings such as crème-caramels and rice-puddings. Even desserts that sound familiar such as tirasmisu or cheese cake are adjusted significantly so if your kid is looking for a familiar treat, we recommend you cast your eye over the dessert trolley or check out the other tables before committing to a choice. If you don’t like what you see, you can always stop at an ice-cream parlour or a pasteleria which is a pastry shop and pick something up there. 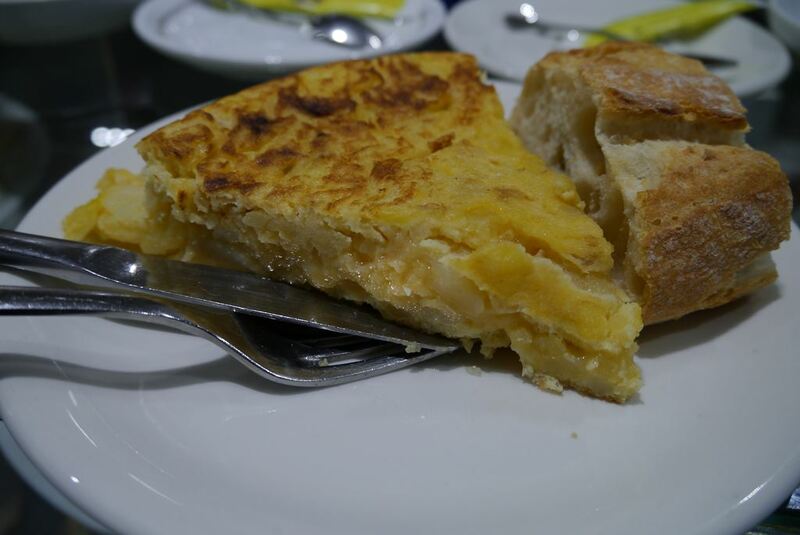 As we mentioned earlier, tortilla is the perfect snack food in Spain and it’s easy to order because the bars will usually have it on display so it’s a question of simply pointing, if your Spanish isn’t brilliant. 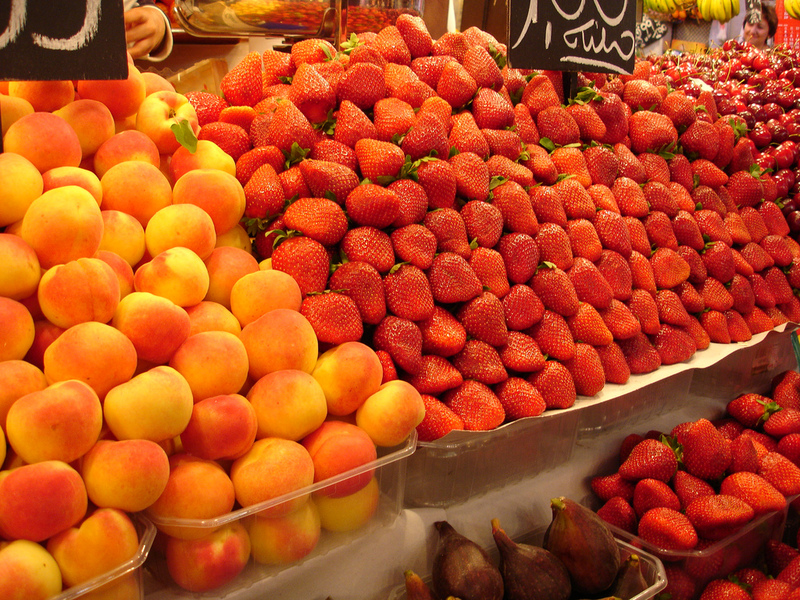 Fresh fruit is wonderful in Spain and you’ll find lots of markets, supermarkets and fruit shops selling wonderful seasonal fruit. It’s often bought by the kilo and you’ll be surprised at the great value to be found. Strawberries, cherries, doughnut peaches, nectarines, bananas and much more. Mmmm. Read our post about the best food markets which are great for fresh fruit. Did you know kids snack on olives here? They are served at kids’ birthday parties. BTW if you happen to be invited to one of those, you’ll find them much more savoury affairs than sweet – and they usually start later than you might expect at 5pm in the evening (which is actually the afternoon in Spain). If your kids don’t already eat chorizo, get them into it. It’s perfect in a breadroll as a snack – you can get one at a bar or pop into a supermarket or foodmarket and get a few slices and a breadroll. 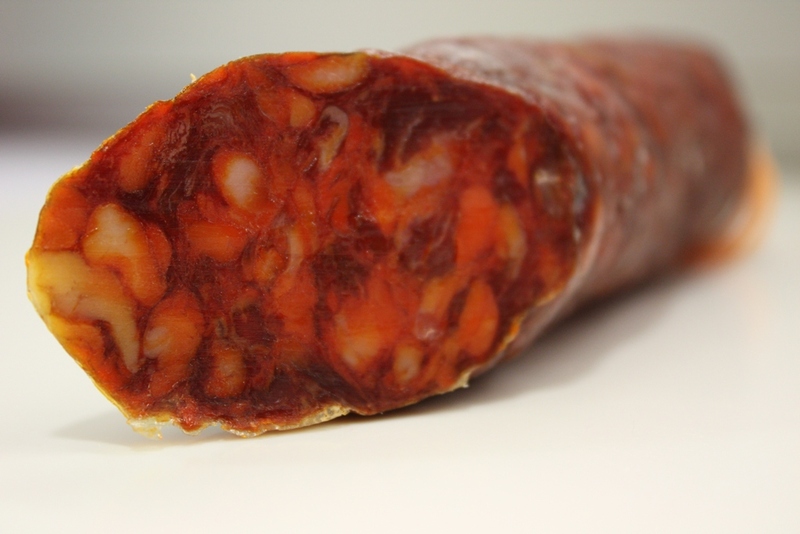 Chorizo de Pamplona is the most processed type of chorizo and is the most popular with younger kids starting out as it’s less chewy. But you should encourage yours to try the chorizo iberico and maybe even the Catalan fuet or the peppery salchicon too. Unless your kid likes spicy food, stay away from cold cuts with the words ‘picante’. 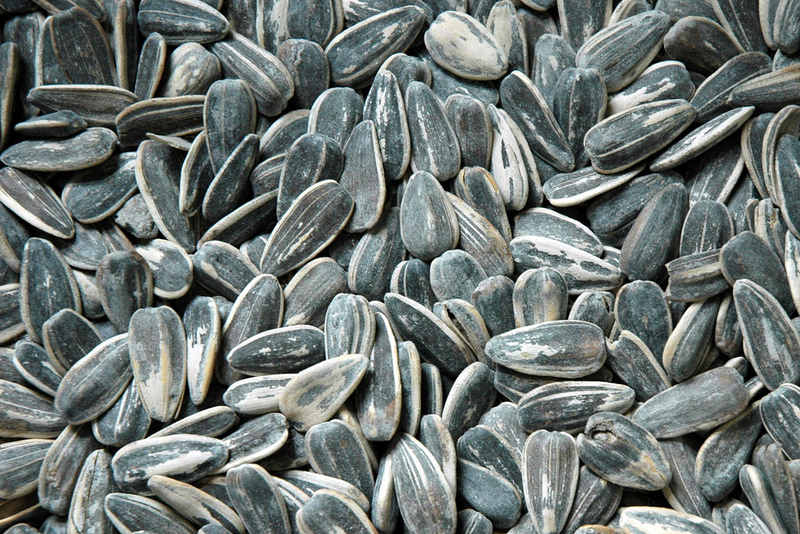 Another snack that seems strange at first is the sunflowers seed! Known as pipas, they are purchased in their shells and the trick (which everybody here learns) is to crack open the shell in your mouth and twist out the seed. It’s a bit messy at first but if you are looking for an ice-breaker for your kids, they could do worse than carry around a few pipas. And a football or a skipping rope. Chocolate is consumed a little differently here. The Spanish don’t snack on chocolate – you’ll probably never find a Spaniard munching on a bar of chocolate on the street in Spain. Spaniards don’t tend to eat on the move as a general rule. You will find some chocolate in the schoolyard but curiously it’ll be in a sandwich – either as in the form of chocolate spread or sometimes a few squares of milk chocolate just placed inside a breadroll. Give it a go if you want the kids to try something from here that they’re sure to remember! If your kids just need a chocolate pick-me-up on the go, you can still buy a bar of Milka or Nestle Red in the supermarkets, sweetshops and kiosks. Keep an eye out for specialist chocolatiers such as Cacao Sampaka, Faborit, Escriba, Valor and many more. 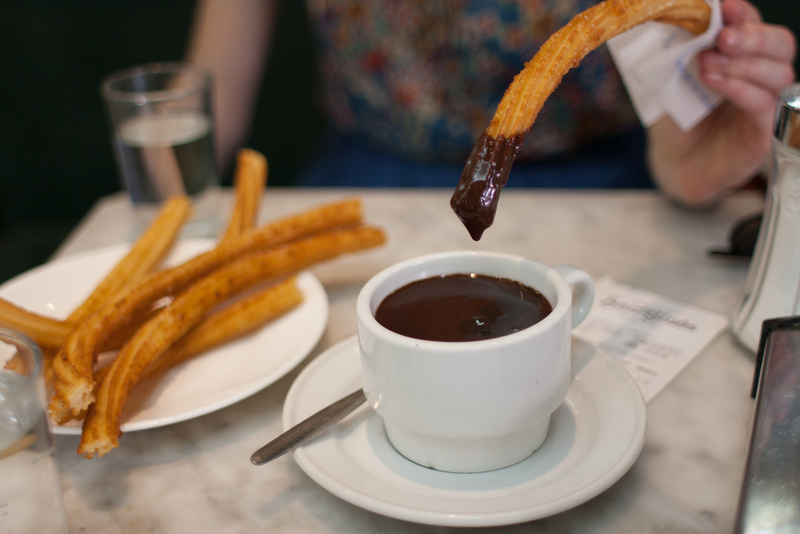 Of course, the ultimate Spanish chocolate experience is to have ‘chocolate con churros’ – which can be loosely described as sugared fried dough served with a very thick hot chocolate for dunking. You’ll find many bars serving this snack but we recommend seeking out a specialist. Ask your hotel receptionist for the best ‘churrerias’ where you are staying. This may or may not be a churros van in the main square – which are often the freshest and the best! You might struggle to get pancakes in Spain, but if you see ‘tortitas’ on offer, it’s practically the same. Usually served as an afternoon snack with cream and chocolate, when they are well done – mmmm! A perfect pick-me-up after a long sightseeing session! 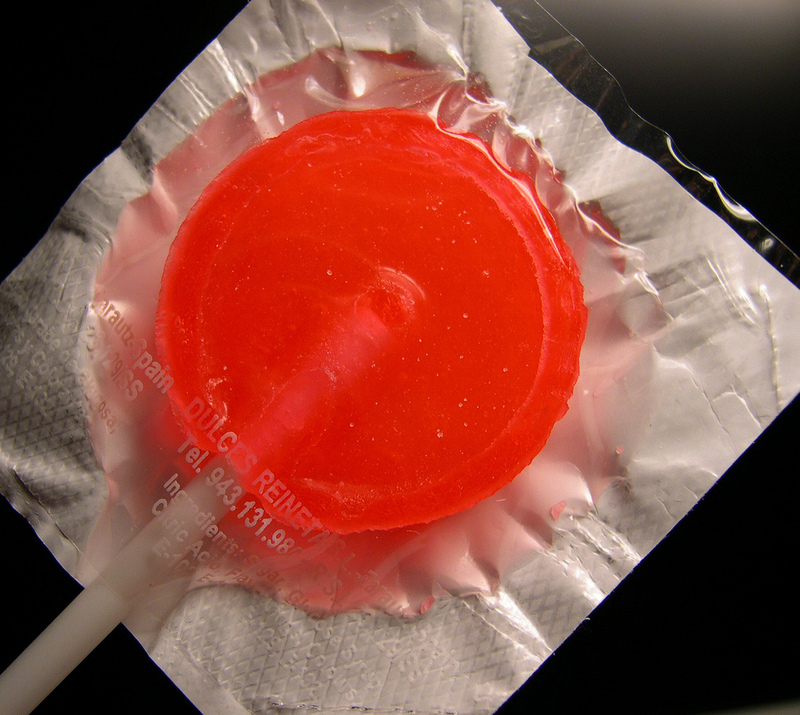 And speaking of sugar-rushes, you should know that lollipops are everywhere. Maybe it’s because the Chupa-Chups (pronounced Choopa-Chus) company is Spanish, we’re not really sure. You’ll find lots of shops give a free pop to kids (eg Imaginarium toy shop) and many bars and restaurants do likewise. If you don’t want your kids to eat unnecessary sugar, then a simple “no gracias” will do the trick. We couldn’t write a piece about kids’ food without including ice-cream. 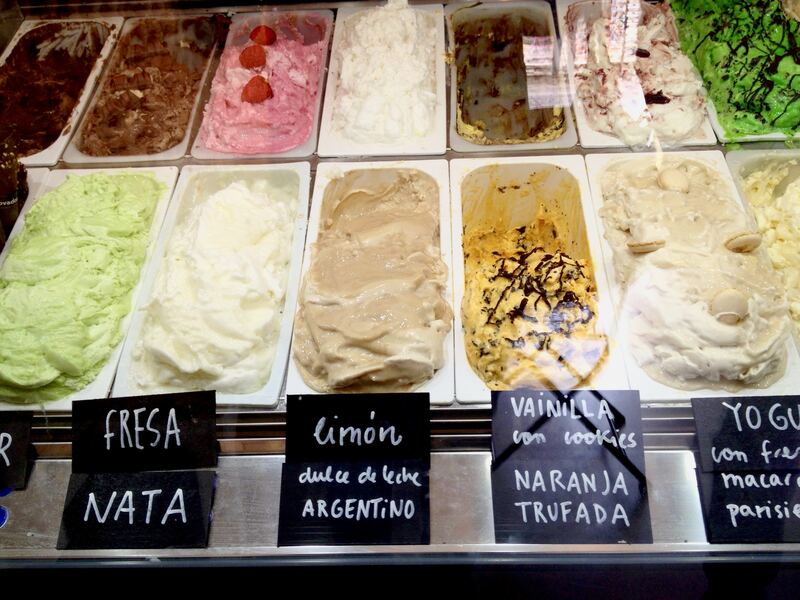 Your kids will love the heladerias (ice-cream parlours) here – ask for your favourite flavour in a cone (cucurucho) or a tarrina (tub) – we find the tub is less messy for smaller kids. You might also find yourself standing at one of the many new frozen yoghurt parlours – which serve the whipped, frozen yoghurt with toppings that range from very healthy to not healthy at all. They are a great treat for a kid who has trekked around a museum or gallery! In the smaller towns and villages, you’ll find the standard ice-cream brands in sweet shops and bars also tend to stock ice-creams and ice-pops in the warmer months. In the bigger cities you’ll find amazing ice-cream emporiums. Pro-Tip: We have to single out Girona’s Rocambolesc run by Jordi Roca who is part of the El Celler de Can Roca restaurant team that won Best Restaurant in the World. You’ll also find a Rocambolesc in El Corte Ingles on Calle Serrano 52 in Madrid. The tapas experience can be a tricky one for little people – especially the pintxos – which are the elaborate mini-fish and meat dishes served on a slice of bread. I know we go on about it, but if you see tortilla and your kids have succumbed, ask for a pincho de tortilla and they are sorted. It’s not just the choice of food that makes a tapas night challenging for kids. It usually requires standing around in busy bars and moving from one bar to another, so for families, we tend to recommend a restaurant that serves tapas at the bar but also offers ‘raciones’, which are plated tapas served to people who are seated. 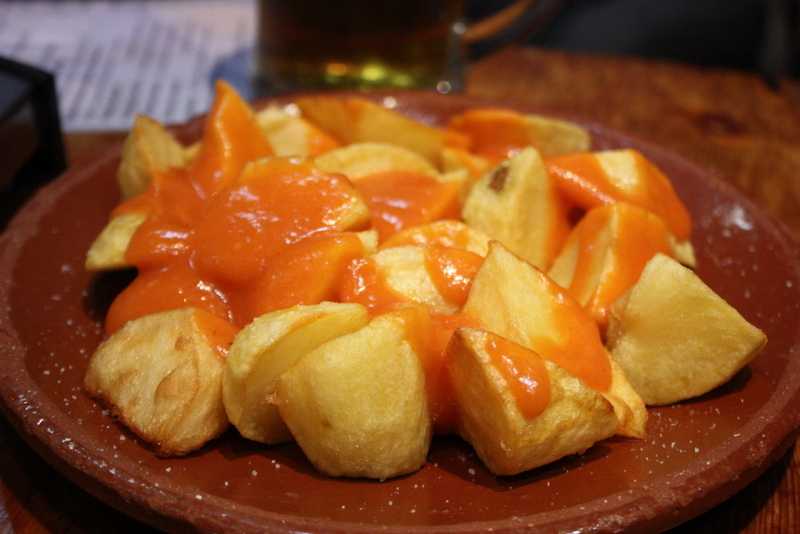 ‘Patatas bravas’ or patatas ali-oli are the no-brainers when it comes to these ‘raciones’ or shared platters. These cubed fried potatoes come with a garlic or spicy ketchup sauce – you might want to ask them to hold the sauce or serve it separately. Ask for these the minute you sit down so your kids will have the energy to be more adventurous later when they are not so ravenous. Other ‘raciones’? Fried chorizo albeit in a cider sauce (the alcohol has been burned off) is often a hit. If kids like cold meats, they might be up for a platter of jamon serrano or embutido which is a mix of cold cuts. Croquetas (which you’ve read about above) may be on offer. Meatballs listed ‘albondigas’ are also another option on many menus. The blood pudding called morcilla is often popular with the kids, especially when they don’t know what they are eating. ‘Huevos rotos’ is another handy one – it’s a runny fried egg served over fries. 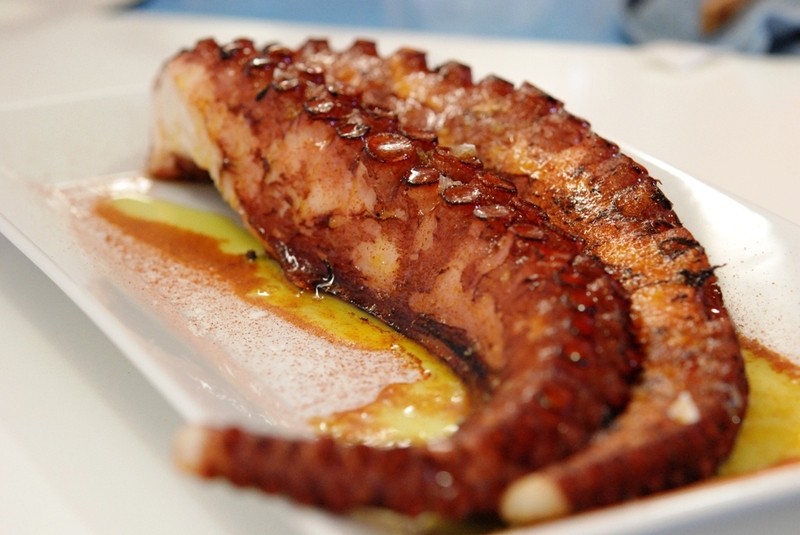 You may want to try squid known as calamares – make sure to chop it up into small pieces. We find most kids draw the line at octopus – although the tentacles might actually appeal to some of the braver kids out there! Unless otherwise advised, tap water is always safe in Spain. If your kids needs a drink – you can ask for a glass of water, that’s a ‘vaso de agua’ in bars and restaurants (when you order something yourself). In the mornings, most bars will make freshly squeezed orange juice to order. That’s when the Spanish have juice. If you or yours want a juice in the afternoon, you’ll find less fresh juices on offer. Bottled pineapple and peach are the dominant flavours of the pre-packaged juices. Apple juice is actually quite hard to come across. If you want your kids to try a local fruit juice albeit a sugary one, ask for a ‘mosto’ which is a grape juice. It’s popular with adults and kids alike. 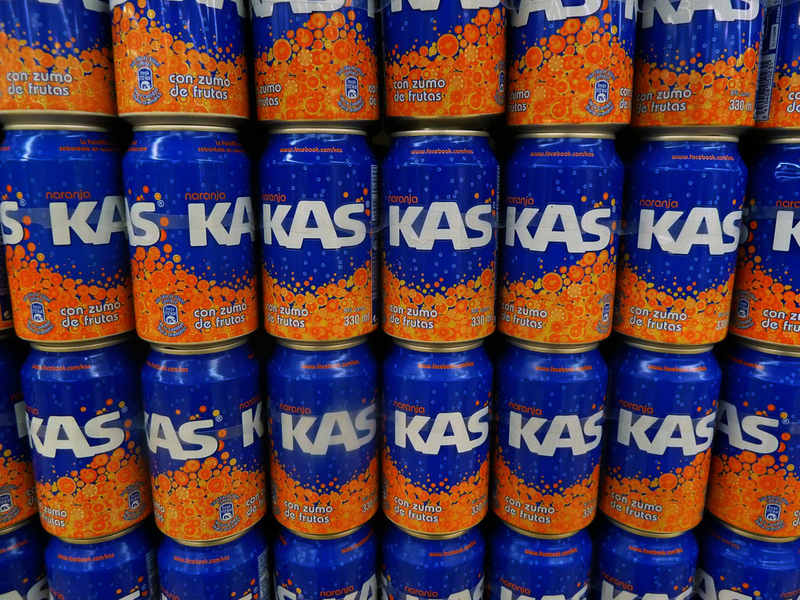 Soft drinks include your usual suspects – the one exception being Kas which is the fizzy orange and fizzy lemon drink of choice in Spain. If your kids order a Fanta, be prepared to be told that the bar only serves ‘Kas’. You’ll usually be asked whether you want the lemon or orange flavour. At Christmas time, adults eat turron – which is a nutty nougat. Your kids may not be interested as it’s very nutty and tricky to eat but marzipan fans are very well catered for – if they are, make sure they try the Marzipan crocodiles. 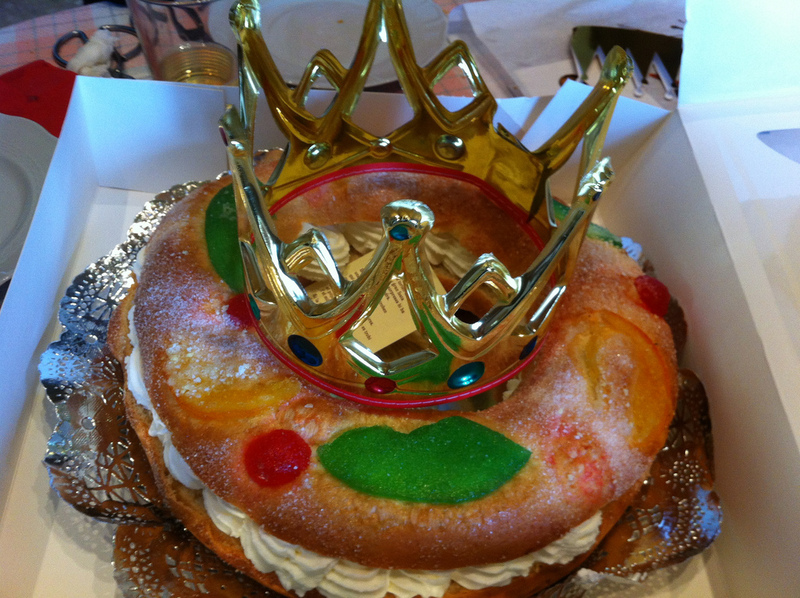 The roscon de reyes – is another one to try, it’s like a bland pannetone but when dipped in hot chocolate, it’s lovely. At Easter, your kids will be able to purchase Easter eggs but you should get your kids to try a ‘torrija’ which is a custard-like fried pudding that’s absolutely delicious, although it packs a punch. Summer is a time for outdoor food – lots of picnics on the beach and BBQs and ice-creams out. Check out beach chiringuitos (huts) for relaxed dining consisting of grilled fish and meats. Halloween is gaining in popularity here and kids have recently started to dress up and trick-or-treat. You might get them to try the traditional ‘huesos de santo’ which are marzipan “saint bones” and if that doesn’t work, you’ll find lots of roasted chestnut stalls around the towns and cities. Each region has its own sweet specialities – we’re more than happy to identify which ones the kids will like best. Allergies are becoming more commonplace internationally and Spain is no different. If any member of your travelling party needs gluten-free, we usually recommend self-catering although we do work with a number of hotels that know how to avoid contamination. You’ll also do well to seek out the Mercadona supermarket chain that prides itself on its own-brand gluten free produce. Nut allergies are just as tricky here – again we’d recommend you go the self-catering route if your child has a severe allergy. If you can’t, you need to state clearly that “mi hijo tiene alergia a los nueces y frutos secos” because you never know where they will turn up. Menus aren’t very detailed in Spain and rarely list all the ingredients used in the assembly of each dish so please highlight allergies or other eating requirements at every opportunity. 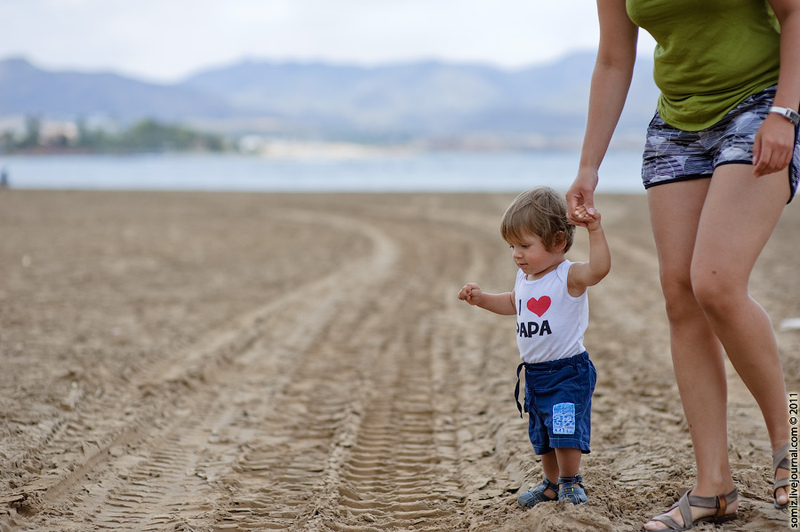 We started this post by saying that kids are welcome everywhere in Spain. Babies are the royalty of the kid world and here in Spain they are revered. You’ll be surprised at how many friendly gestures the waiters and museum staff will make towards your bundle in the pram or buggy. But what should you know about travelling with your ‘bebecito’? For starters, you’ll find almost everywhere is very welcoming to breastfeeding mothers. 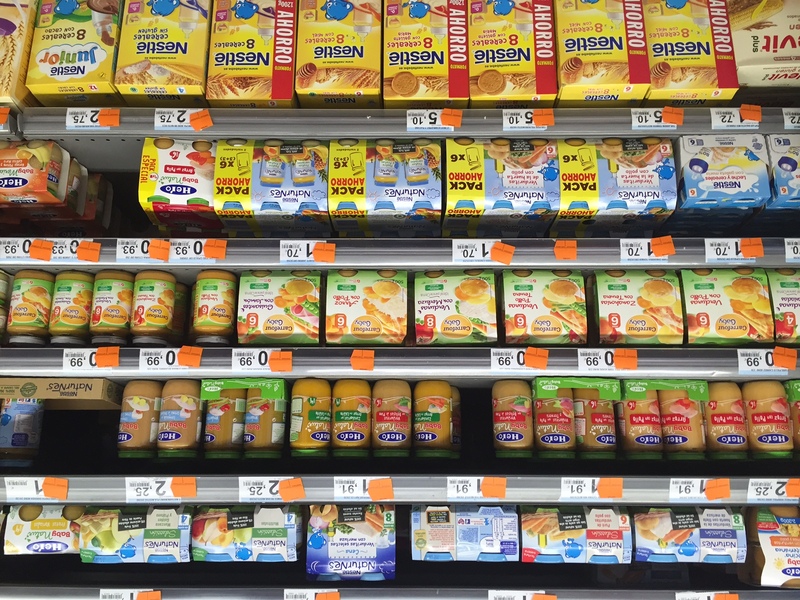 If you need baby formula, you’ll already know that brands change from country to country so if you are travelling for less than a month we suggest you pack what you plan to use. Bars and restaurants are always happy to heat bottles and food jars. Hotels too. 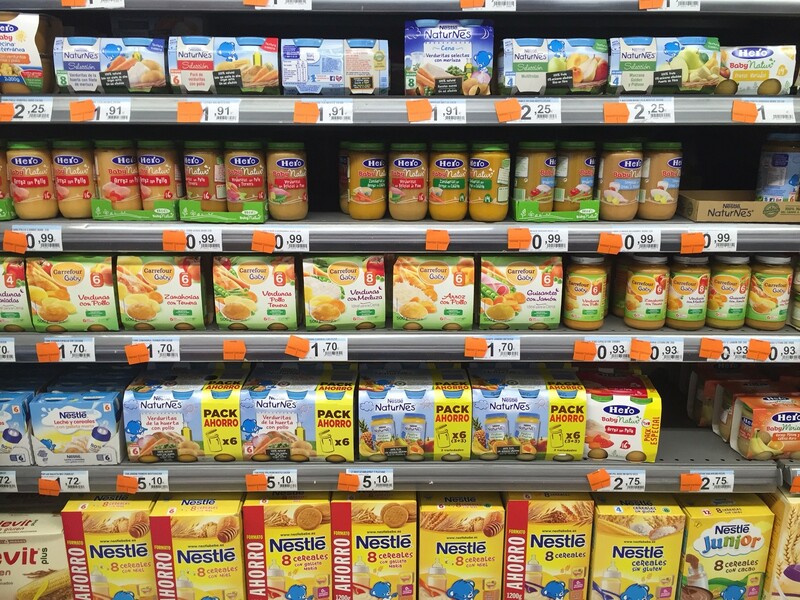 As you’d expect, baby food jars are readily available in chemists and supermarkets. You won’t find the organic ranges you come across elsewhere (parents tend to make their own here) but even the smaller supermarkets will offer a wide range of ingredients and sizes. Not exactly Michelin-star stuff but it will get you out of a fix if you’re not in self-catering accommodation! Make sure to pack a changing mat as you won’t find nappy-changing facilities in most restaurants. If you need to change your little one, you’re best off looking for facilities in a shopping mall, a large hotel chain or a department store. If you are travelling with us, we can pre-book the top attractions to avoid the tiring queues, pre-book restaurants and select the best hotel rooms for your family with all the services that you need whether that’s babysitting, a kids play zone, a chocolate fountain at breakfast or a swimming pool where you and yours can unwind and have fun. And finally, before we sign off, we also encourage you to read our post on mealtimes in Spain which vary significantly from other European countries. It’ll save you some embarrassing moments and may even gain you some brownie points with the kids! And why not read our post on Unusual Food Customs in Spain and ask your kids to keep an eye out for them as they travel around. Posted in Family Breaks, Food & Drink, Getting Around, Insider Spain Guides, Popular Posts, Useful Information and tagged cake, calamares, children, chocolate, chorizo, Chupa-chups, churros, crisps, croquetas, family travel, fast-food, fruit, ice cream, kas, kids, Markets, meatballs, mosto, Paella, patatas bravas, pipas, pulpo, Rocambolesc, roscon, Spain, tortilla, travel, turron.